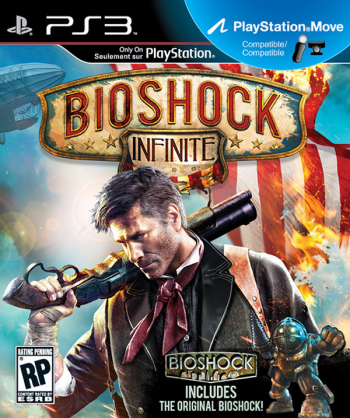 PS3 BioShock: Infinite fans will get the 2007 original bundled with their game. If you were paying close attention to the PS3 BioShock: Infinite box art reveal, then you'll have noticed that the original BioShock is bundled in with your Infinite purchase. If you want it, best relocate to the US, as this promotion is only available in North America. "I can confirm that the PS3 version of BioShock: Infinite in North America contains a copy of the original BioShock," said a 2K spokesman. It's not clear whether PS3 owners elsewhere will get any equivalent deal. BioShock: Infinite, the story of a former Pinkerton trapped in a floating city with a wonder-working woman, is getting a gameplay reveal at the VGA Awards; a brief teaser can be had here. You haven't that long to wait for the game; it's due for release for PS3, Xbox 360 and PC in February 2013.